Does Buddhism Belong to Germany? Since the beginning of this century, we have been confronted with an increasing number of apparently religiously motivated terror attacks and conflicts, with oppression, expulsion, and discrimination, with hatred and violence. Therefore, the topic of religion is increasingly discussed in society. Some argue that the world would be better off without religion, others that faith is a private matter, still others that religion should be anchored more strongly in society and education again. In 2010, this societal interest led to the establishment of the Academy of World Religions which deals with issues of the peaceful coexistence of various religious traditions, a question that, today, is more important than ever. And Buddhism? In the early 1990s, triggered by Hans Küng’s programmatic text “Weltethos“ (World Ethic) and the Parliament of the World’s Religions’ Declaration Towards a Global Ethic (Chicago 1993), Buddhism – in the framework of the five world religions – was increasingly included into Philosophical Studies and Religious Education in German schools. More recently, however, a narrowing down to the three Abrahamic religions begins to emerge – not least even in ’Religious Education for All’ in Hamburg public schools. Therefore, the question arises: What about Buddhism? Does it also belong to Germany? I am standing before you as a Buddhist nun, therefore, it is clear that I believe that Buddhism does belong to Germany. Perhaps my arguments can convince you of that. Globally there are about half a billion of Buddhists, the greater part living in the Asian and Pacific region. In Germany, there are about a quarter of a million of Buddhists, both ethnic Asians and native Germans. Buddhism has increasingly become part of German culture for 200 years. The philosopher Arthur Schopenhauer (1788–1860), for example, described himself as the first “European Buddhist“.1 He is considered a crucial precursor of Buddhism in the West. Even Richard Wagner (1813-1883) was – inspired by Schopenhauer – most deeply influenced by Buddhist thought. It is against this background that I will examine the relevance of Buddhism for today’s society, first of all touching upon Hamburg where there are about 20,000 Buddhists2 and more than 60 Buddhist centres and groups of different schools who help to shape life in the city. The first Buddhists in Hamburg are documented in the year 1906. The medical expert Prof Dr Hans Much (1880–1932) who, among other things, acquired fame as the discoverer of a tubercle bacillus and the developer of the Spalt painkiller tablet, presided over the Hamburg group “Bund für buddhistisches Leben” (Federation for Buddhist life). But despite this long history in the city, Buddhism still has difficulties getting recognised as an equal here – not, however, by the other religions but on the level of bureaucracy of the Free Hanse City. Thus it has already been one year that the legal department of the Senate has been examining whether the non-profit Buddhistische Religionsgemeinschaft Hamburg e.V. fulfils the criteria of a religious community according to Article 140 of the German Basic Law.3 This association is a union of ten Buddhist centres that have already existed for decades, cooperating in many trans-traditional questions. The question is whether, as a legal entity under private law, it carries out those tasks which have a so-called “identity-building character” for the faithful and their religion, or only coordinates shared interests. The question, therefore, is not just whether Buddhism is a religion but whether this Buddhist institution, through its statute and the number of its members, “guarantees permanence”, i.e., at least 30 years. This, considered philosophically, is a challenge for a Buddhist since nothing that emerges from causes is permanent; instead, we say, “everything contingent is impermanent”, and keeps changing from one moment to the other. Or, in the words that are ascribed to the Greek philosopher Heraclitus: panta rhei (ancient Greek πάντα ῥεῖ), in English, ‘all is in flux’. Besides, we might ask whether, due to the great diversity of Buddhist traditions, there could be unitary organisation at all, e.g. when developing study material for Religious Education. And we might ask whether there are enough children and young people from Buddhist families in Hamburg to justify such recognition. This is difficult to answer because the registration form of the Hamburg registration office only leaves the choice between Protestant-Lutheran, Roman Catholic, Jewish Community Hamburg, or Reformed Churches. All other religious as well as non-religious citizens fall into a single category “Other Religious Communities/Not Stated/None”. The existing Buddhist centres are financially independent and enjoy regular visits both by Buddhists and Non-Buddhists from Hamburg and the region. Why then the efforts for religious recognition at all? The answer is: Because Buddhists can then make a valuable contribution on many levels not only to each other but to society as a whole. But before I demonstrate the contribution this community already makes, and what, with appropriate support, it could make in the future, let me first briefly highlight how this problem arises in other countries in Europe. In Italy and Spain, for example, the taxpayer can state in his or her tax declaration which religious community or which other social or cultural purpose are to profit from their dues. In Sweden, the Swedish-Buddhist Union receives 5 Euros per year per registered member from the state. Buddhists there are primarily engaged in crisis management and counselling. Two coordinators receive 40% of their funding through state subsidies. They are active in prison chaplaincy and, among other things, lead a youth project intended for prevention of various forms of violence (including violent extremism). In reflection groups at Swedish secondary schools, they started, some time ago, to introduce young people to brief meditation practice. In France all religious communities enjoy the same rights and support.4 Thus, for example, they have equal rights to airtime in the public television station France 2, where, on every Sunday, different traditions of Buddhism may take turns presenting their “Buddhist Wisdom“5 for fifteen minutes. Another positive example is Austria: There, the Austrian Buddhist Religious Association has been nationally recognised as a public corporation since 1983.6 Since 1993, Buddhist Religious Education has been taught at public schools, and since 2017, Buddhist teachers for Religious Education have even been trained in Vienna. According to reports by the Kirchliche Pädagogische Hochschule Vienna/Krems, the demand is generally increasing. And in Hamburg? 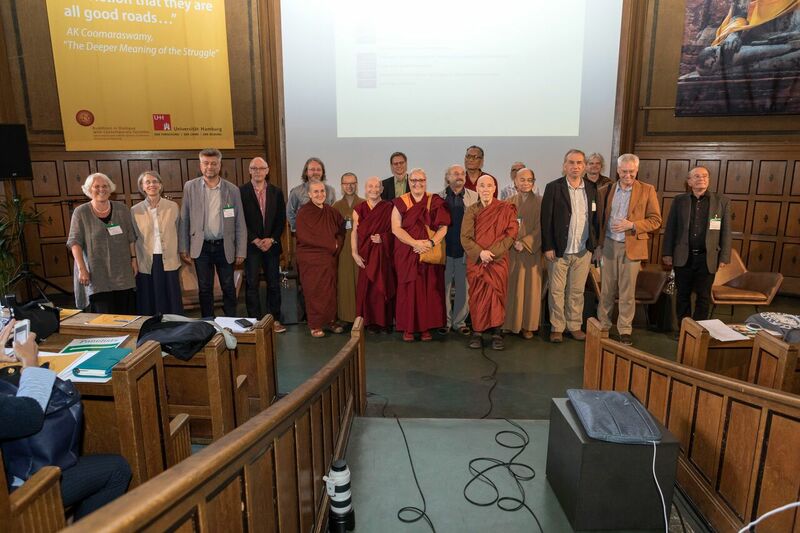 Even in the 1990s, the Tibetan Centre and the Buddhist Association assisted the what was then the North-Elbian Church to launch ‘Religious Education for All’ in Hamburg. But since the so-called state treaties with Alevism and Islam exist, Buddhists are no longer included in the development of ‘Religious Education for all‘ by the school authority – even though the Interreligious Forum Hamburg, primarily Bishop Fehrs but also the Schura (Council of Islamic Organisations) and the Alevi Community, support the Buddhist’s concern. But Buddhists want to be co-responsible. Thus there could be a teacher training for Buddhist religion in Hamburg in the future. At the University of Hamburg, there are already good resources: the permanent professorial chairs for Buddhist Studies, Religious Studies, and Interreligious Theology and, not least, even my new guest professorship. A corresponding course with courses both from the inside and the outside perspectives could be established. So far, only Christians, Muslims, and Alevis can become Religious Education school teachers in Hamburg. In the future, even the Jewish community will be able to commission Religious Education teachers. For the time being, Buddhists, Baha’i, Hindus, Sikhs etc. are excluded. From an academic perspective, however, it is important that training does not just happen in a private framework but that it is intellectually responsible and certified in public educational institutions. This would guarantee that a minimum standard of quality for teachers is established, which cannot be achieved if they, as it were, are “imported” from Asia and the training takes place exclusively in Buddhist centres. It is also important to train Buddhists in pastoral care. In Protestant and Catholic theological studies, the training in pastoral care is part of the Practical Theology curriculum. A similar supplementary training would make sense in a Buddhist context. It would include, for example, psychology and intercultural competence for pastoral care and hospice work. This is also a matter of a transfer of knowledge between Asian and local cultures, especially in crisis situations. What could “recognised” Buddhism concretely contribute to society? Buddhism is not only a religion: it also has a philosophical and a scientific dimension. Therefore, it is also increasingly interesting to Non-Buddhists. Due to the growing interest by psychology, medicine, and pedagogy in Buddhist “tools” like meditation techniques and mindfulness training, a dialogue opened between the Buddhist traditions and the sciences already in the early 1980s. This is not a matter of faith but of the relationship between mind and body, e.g., the effects of different meditation practices on the human brain. One of the largest global research projects, one which emerged from the International Mind & Life conferences which have been held since 1987, is conducted under the leadership of Prof Dr Tania Singer at the Max Planck Institute for Human Cognitive and Brain Sciences in Leipzig since 2013. Among other things, Buddhist methods of training the mind are part of a long-term study on mental training there. It is investigated what effects such a training has on the brain, on health, stress, wellbeing, and social behaviour. Meditation is also said to alleviate early symptoms of dementia and Alzheimer. Before this, in 1979, the molecular biologist Jon Kabat-Zinn at Massachusetts University developed ‘Mindfulness-Based Stress Reduction’, (MBSR) following a Buddhist meditation technique, a programme for stress management based on mindfulness. Clinical studies show that MBSR helps to better deal with diseases, stress, fear, and depression. One might also mention here the Buddhist monk Matthieu Ricard, another molecular biologist, who currently cooperates with Neuroscientists at the universities of Madison-Wisconsin, Princeton, and Berkley. They examine the effect of mediation and mental training on the brain. Tania Singer once jokingly described him as her “favourite guinea pig”. Thus, much of what Buddhism has to offer has already been taken up by science, linked with Western insights, and further developed on a secular level, both by psychology and pedagogy and by the natural sciences. Some things are also tested locally, e. g. mindfulness training in schools. The project AISCHU mindfulness by Vera Kaltwasser proved especially valuable in our local schools. Based on such experiences which have already been gathered in other countries and partly even in Germany, the Buddhist Religious Community in Hamburg tries to get better access to public institutions like hospitals, asylums, prison, police training institutions, and military – any place where the concern is public service. Many Buddhist centres are inundated with such requests. Unfortunately, however, they are currently neither qualified nor –in number– able to meet this demand. In the Netherlands and the United Kingdom, as well as the United States, Buddhists are included in so-called chaplaincy courses. One could take such examples as a point of departure when developing training programmes. Government support for advanced training and, through recognition of paid educational leave would, therefore, be helpful. Both, in Germany and in Italy, there are already cases in which not only individual convicts but also prisons addressed Buddhist centres with the question it they can offer courses for dealing with emotions, especially with aggression, in prisons. In Italy, the training for this purpose takes place at Rome University. Some Buddhists are active in drug prevention and care for the homeless. Even here, there are already first approaches in Hamburg. In the USA and Australia, there has been much more progress in this. But also in Germany, there are many people who would be ready to volunteer, but what is needed for this purpose is a professional coordination and corresponding jobs – and, as mentioned already, minimum qualification. An increasingly important context where Buddhists already contribute a great deal and in which they could achieve much more if the corresponding public resources were available is terminal care and hospice work. In these fields, Buddhist caregivers are recognized highly competent. Meditations on death and transitoriness, getting familiar with dying and death already during one’s lifetime, are well-developed Buddhist practices. On the one hand, it is a matter of using every moment of life well and consciously, that is, living everyday as consciously as if it were one’s last. On the other hand, many, although not all, Buddhists, believe in rebirth. Therefore, Buddhist traditions have developed many tried and tested procedures for accompanying people when they are dying. They should be able to say farewell as peacefully, free of pain, and consciously as possible, being supported in, once more, remembering the good of their lives. In Germany – even in Hamburg – there are already quite a number of funeral homes which also offer Buddhist funeral services. The Buddhist Religious Community Hamburg is currently trying to acquire a burial ground and to use a chapel in Ohlsdorf cemetery. There is a great demand for all of these services, but the necessary professional training for Buddhists remains unavailable. Buddhists in Germany cannot acquire a “theological” and reputable training in pastoral care similar to that available to representatives of other faiths. So far, there is no facility for Buddhist “Theology” at any German university. For Christianity, in contrast, about 700 professorial chairs are available nationally, for Islam about 16, for Judaism, according to my latest information, 2, and for Alevism 1. So far, Buddhists have tried to bridge this lack with their own means or through private charities. Thus, a colleague from the Netherlands told me recently that the Buddhist Union of the Netherlands (BUN) founded a charity which cares especially for the training and authorisation of Buddhist Religious Education teachers for classes in school as well as of Buddhist chaplains. The VU University Amsterdam offers interreligious chaplaincy training, and even at Oslo University, such training is supported by the government for Buddhists as of late. As far as I know there, is no comparable opportunitiy in Germany at this time. In society, in contrast, Buddhism has long since arrived, even in colloquial language. Typically, the expression “rester ZEN” in France means “remaining cool/relaxed/calm”. The range of courses and literature has become unimaginable; Buddha statues are to be found everywhere, from hardware stores to railway station bookshops. Today, Buddhism is certainly also attractive to many people because it is a “religion without a creator god” and does without terms like original sin, punishment etc. The principle of causation of cause and effect, that is, Karma and the emergence in interdependence, are closely interacting here. It complies with the wish for self-determination and emphasises individual responsibility. Considered theologically, Buddhism, like the theistic religions, is concerned with the cause of suffering. It is ascribed to one’s own imperfection, one’s own delusion. Therefore, the question of guilt does not arise, nor does the question of theodicy or God’s justice. Thus Buddhism urges people to take responsibility for their lives, for better or for worse. Considered from a secular perspective, this idea is fully compatible with the thought of the European Enlightenment and the “right to self-realisation”. A point to which I will return. We must concede that many things run well even without government support, and the acceptance of Buddhism in society is definitely a gratifying development. Nonetheless, WE should not forget that Buddhism is not exhausted by mindfulness training and meditation; it is also a religion and not just a philosophy or worldview. Why is Buddhism able to make a valuable contribution as a religion? Why is it, by its nature, especially well-suited for today’s society? I think that this is, on the one hand, because of its profound spiritual content and, on the other hand, because it is undogmatic in the sense that it considers a philosophy without implementation in practice as useless. In some respects, it could thus definitely be considered as an applied science of the mind. Ideally – I am not talking about the social reality now which is sometimes far from ideal –, Buddhism is characterised by tolerance; it does not take itself to propagate the only true way to salvation and, as a rule, abstains from wanting to proselytise others.7 Traditionally, Buddhism stands for the motto: Come and see for yourself! Buddha’s teaching is considered pragmatic; it propagates both/and rather than neither/nor. From its foundation, Buddhism is a religion of realisation and not a religion of belief. Here, exceptions like the East-Asian Amida Buddhism rather confirm the rule. Comparable elements based primarily on trust and spiritual devotion can also be found in the Tantric Buddhism of Tibet and Japan. At the centre of Buddhist teaching, there is always the effort for insight onto the Four Truths. Firstly: Life is connected with suffering. Secondly: The causes for suffering are of a psychological nature: the egotism of the human being, our ego-centeredness and never ending demand for more. Thirdly: It is possible to change radically in order to free oneself from the suffering and its causes. If not in this life, then in the course of future ones. And if not through realisation, then through trust in the Buddha who can appear in different ways, not only as a historical person but, in Mahāyāna tradition, also in a transcendent body. And fourthly, there is a way to free oneself from the psychological trap of egotism and delusion – that is, through concrete methods from the area of ethical, caring behaviour, meditative immersion, and by cultivating wisdom. The two main pillars of Buddhism are, on the one hand, one’s own mindful, preferably non-violent, caring actions and, on the other hand, the training in wisdom. Values like love and care are of central significance in Buddhism. Ideally, Buddhist care is directed to all living beings without exception, whether they are friend, strangers, or enemies, human or animal. An effort is made to develop unselfish love, to strengthen the spontaneous feeling in oneself of being connected with all and all others. This means that Buddhists even include the environment – some prefer the term shared world. In this sense, it is a matter of respect, do-responsibility, and care for each other. Thus Buddhism is also a philosophical system of ideas and values, presenting a profound threat to greed which is promoted by our consumerist society. The fear that is used in order to justify military violence is questioned by Buddhist values just like the capitalist system as such. Whoever prefers Buddhist frugality, a simple lifestyle, as it were, thus also self-explanatorily counteracts all those dangers which, through unlimited consumption and through the greed for ever more, lead to climate change, to the extinction of species, and to natural disasters and ultimately bring about the destruction of our living space. Therefore, it is not surprising that Buddhists increasingly implement their ethical ideas even in professional life, dealing, for example, with environment protection and animal welfare or by even working as bankers. The success of the Anthroposophical GLS Bank which upholds ethical guidelines shows that this way corresponds to the desires of many people. At the same time, it should not be denied that it is not the main objective of Buddhism to improve the world but to reach awakening, the liberation from suffering and the attainment of true, lasting happiness – and for all living beings. But one does not exclude the other. Thus we get to the second pillar of Buddhism: Wisdom. Like other religions, Buddhism is about the quest for truth, precisely speaking, insight into the ultimate truth through meditation. At the centre for understanding truth is here the teachings about the emergence in interdependence (pratītyasamutpāda) and about the emptiness of intrinsic existence (śūnyatā). The meditative exercise in these two views leads to, on the one hand, becoming conscious of causal contexts and, on the other hand, considering things in a multi-perspective way in their complexity and particularity. The visualisation of emptiness safeguards against generalising things, stigmatising certain persons or groups, or lapsing into an essentialist view. Here, deconstruction and reconstruction walk, as it were, hand in hand. In everyday life, this very concretely helps to question spontaneous impressions and value judgements and to relativize them. Both cognitive intellectual power and emotional self-regulation are strengthened in meditation, and thus complex and discriminating thought is connected with emotional openness. In this process, a mental level is opened up which enables a better understanding of the complex contexts of our interconnected world. Thus a feeling of connectedness and cohesion emerges, of togetherness rather than of being set against each other, and from this, in turn, emerges a force for effecting something good together through solidarity. Buddhists, therefore, like to appeal for tolerance and respect for everything and everyone. They make an effort not to exclude others, not even other religions, but try to coexist peacefully with all, causing no suffering or as little as possible. Such are the ideals at any rate. When we look at Myanmar and the atrocities there, we see that Buddhists, unfortunately, also can behave differently. Without doubt there are also fundamentalist and sectarian Buddhists but such tendencies cannot be linked with a particular strand of tradition but rather there are people with such a view in every religious community. Therefore, an education towards pluralisation is necessary, not only in the secular field but macro-socially, that is, also in the religious field. It is important to talk about shared values, about Common Ground, in a society with an increasing diversity, in the religious as in the non-religious field. This is not only a matter of shared knowledge but also of a shared set of values that is to be concretely implemented in practice and to be preserved. These shared values in Germany are already encoded to some extent by the legal framework. Article 137 (3) of the Weimar Constitution of 1919 which has become part of the Basic Law (Article 140) says that each religious community regulates and administrates “their concerns independently within the limitations of the law that is applicable for all”. This means that only when Buddhism considers the ideals of the European Enlightenment, it can unfold its positive potential in modern societies. By enlightened Buddhism I understand a Buddhism which acts in harmony with our Basic Law, with the European Human Rights Convention, and with the Universal Declaration of Human Rights and the other laws that apply to all. The right to self-realisation can, as explained beforehand, also be substantiated from the teaching itself. For example, when it is a question of equal treatment of men and women, religion must not be an exception. Religions should not lag behind the Universal Declaration of Human Rights. Relativizing gender justice for cultural or religious reasons is, in legal terms, not admissible. When we talk about value formation, religious institutions, especially when they receive public support from tax revenue, should be expected to give a good example here. Thus we must ask whether religions that are included in education, like also Buddhism, recognise values of contemporary society like freedom, democracy, human rights and how they implement them in practice. A contemporary contextual exegesis of millennia-old or centuries-old texts is a great challenge for all religions of the 21st century, even for Buddhism. Let us remain with this example. Since the Buddha, 2,500 years ago, did not make any statement about the Free and Democratic Basic Order and the context in which he taught was a totally different one, it is a task for “theologians” or “Buddhologists” to make suggestions on how to derive or reconstruct a contemporary gender-just Buddhism compatible with democracy from what is available, from that which already exists in the traditions of Buddhism and their texts. In this process, the respect for one’s own tradition appears in the criticism from an internal perspective wherever it deviates from its own basic principles. It goes without saying that research must be open-ended in this sense even in the field of “theology”. It must not simply defend and substantiate dogmas. Here, interreligious dialogue on an academic level is a good control valve, that is, a theology of religions or precisely a dialogical theology as it has been developed by our Religion and Dialogue in Modern Societies (ReDi) research team at the Academy of World Religions of Hamburg University since 2012. For a dialogical theology, at least two religions are necessary; at the Academy of World Religions they are ideally at least five or six. We must study theology not side by side but together. Our collective goal must be a new reading and the shared reflection of texts, of mutual and multi-perspective interpretation with the aim of finding common answers to urgent contemporary questions in a constantly changing context. One condition is the readiness not to consider one’s own religion as the only right one for all but to be conscious of one’s own human fallibility. This all makes sense for scholarhip and research. But what does it mean for Buddhists? There is often a need to wonder what the Buddha would say today regarding this or that question, on the question of equal treatment of women, on the topic of homosexuality, on organ donation, on poor and rich, on the refugee issue, on the behaviour towards the environment/shared world, on animal ethics, and on the many other questions that are relevant for societies today. There are no readymade answers to that. Everyone must answer that for themselves. But a fundamental training at universities could be helpful for orientation here by indicating different conceivable ethical answers. We must ask whether the task of enlightened religions is really still “identity-shaping” as it is understood according to the current interpretation of the Basic Law. Might it not be better to think of this task as one of strengthening a We-feeling, of finding Common Ground, and to shape a shared identity in the sense of a shared humanity? The question of how religion and identity are to be understood from a Buddhist perspective and what role education has in this may be exciting but we have to save that for the future. For we must now draw this discussion to a close. I hope that I was able to convince some among you of the relevance of Buddhism to our contemporary society. If I have not done so, I promise that during the tenure of my guest professorship in the coming years, I will stand up for introducing the values of Buddhism in society, and what I will ensure that it gets an appropriate place at Hamburg University – although it is true even in the field of religion that “everything contingent is changeable”. 1 https://www.the-tls.co.uk/articles/public/arthur-schopenhauer-footnotes-to-plato/; https://www.zeit.de/2010/35/Portraet-Schopenhauer, retrieved 13 June 2018. 2 By their own account more than 20.000: https://www.tibet.de/fileadmin/pdf/Kooperationen/BRG/Presseerklaerung_BGH_Vesakh_2017_2.pdf, retrieved 09 June 2018. 3 Religious associations acquire legal capacity according to the general provisions of Civil Law and upon application, they are to be granted the same rights if they offer the guarantee of permanence through their constitution and their number of members. 4 A special status is enjoyed by Alsace where a church concordat is still valid. Even there, Buddhists receive the same support. 5 Sagesses Bouddhistes: http://www.buddhistwomen.eu/EN/index.php/Sakyadhita/BuddhismInEurope; For TV examples see: http://www.buddhistwomen.eu/FR/index.php/Documentation/Video, http://www.buddhistwomen.eu/FR/index.php/Documentation/TenzinPalmo, and http://www.buddhistwomen.eu/FR/index.php/Documentation/JeanneSchut, retrieved 03 June 2018. 6 Portugal followed in 1998, Italy in 2000. On this see also Freiberger (2011, 168). 7 This refers to mission in the negative sense of attempting to convert people from their religion to another one. An organized effort to spread the Dharma would not be considered as unwholesome (Skt. akuśala), but wholesome (Skt. kuśala), as long as the motivation is pure. This would entail to avoid the claim to sole representation and any kind of violence. Teachers are taught not to teach the Dharma to anybody who has not asked for. 8 English online source: http://europeanbuddhism.org/news/blog-buddhist-voice/, retrieved 28 July 2018.